Pre-Intermediate level. Over 10,000 meanings clearly explained. Second Edition. - Bloomsbury Publishing PLC, 2004 - 384 pages. 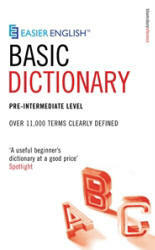 The Easier English™ Basic Dictionary is designed especially for elementary and pre-intermediate students of English. With over 11,000 terms, it includes the basic vocabulary needed to understand and study written and spoken English at this level, and is particularly useful for students taking the Preliminary English Test (PET) or the Key English Test (KET) exams. With definitions written in simple English, clear notes on grammar, irregular verbs and easily confused words, as well as pronunciations for all entries, this is an invaluable aid to students of English.